That list is bad enough, but the context is even worse as all but two of those losses were played at Big Ten home arenas. This also excludes a number of close shaves against the likes of Florida State (119), Clemson (123), USC (150), North Florida (166), Missouri (170), St. Francis NY (172), Virginia Tech (179), Drexel (180), Cornell (187), Duquesne (200), Elon (218), Monmouth (241), New Hampshire (248), Loyola Marymount (251), Marshall (268), and Navy (322). Last year, the conference had 8 non-conference losses to sub-100 teams, and while the injection of Rutgers does boost that number, it's also clear that this year is not better than the last. There are bright spots. Wisconsin is of course rolling along, and the rest of the conference figures to resemble something like a SEC haplessly trying to stay on the court with Kentucky (OK, probably not that bad, but seeing Wisconsin's efficiency margin this season start with a "0.2" should surprise exactly no one). But aside from the Badgers, both Maryland and Minnesota have my attention. The Terrapins have impressive wins away from home against Iowa State and Oklahoma State, and have a lone blemish against Virginia who, it should be noted, is currently a carbon copy of Kentucky. UM (ugh, another UM? Can I abbreviate them something else, like UM-CP? It's harder to do that for Michigan—UM-AA makes it sound like the school has a drinking problem. And I'll cop to avoiding this issue altogether for Minnesota. UM-TC?) has found success by owning the free throw line—the Terps have made 229 free throws against opponents that have attempted a mere 170. The defensive side of the equation looks familiar, as Mark Turgeon has a very tall team that likes to mix in some zone. To me, that looks like vintage Thad Matta, whose Buckeyes rarely fouled with the likes of Greg Oden, Kosta Koufos, B.J. Mullens, and Dallas Lauderdale patrolling the paint. Thus far, Maryland (the 6th-tallest team in the country) appears similar. 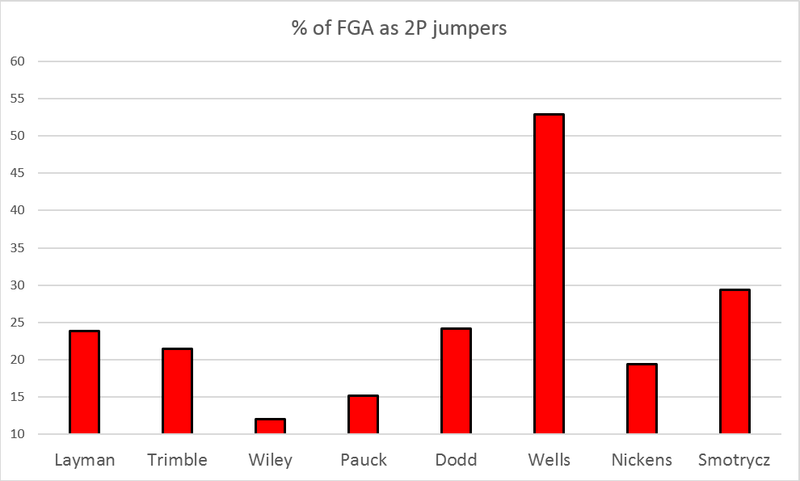 This makes Dez Wells' return from injury unfortunate, from an analytic perspective. Here we are on the eve of conference play, and Turgeon's offense is hitting on all cylinders by eschewing the worst shot in basketball. Now Wells is back, but if UMCP's offense does hit the skids, the #narrative could just as easily been the familiar tale of reality coming in the form of conference play. C'est la vie, I suppose. While Maryland already appears to have signature wins, the best Minnesota can offer in that respect is a neutral court win over Georgia. The Bulldogs probably aren't bad this season, but it's also probably too early for Athens to pontificate on seeding scenarios at the Dance. And indeed, I'm not as sold on the Gophers' odds of keeping this up. Although, unlike Penn State, Minnesota is largely beating the pulp out of its candy non-conference slate, the how here is important. As one might expect out of a guy named Pitino, the Gophers have been causing turnovers at a very high rate (3rd in the nation in opponent turnover rate, 2nd in defensive steal percentage). This absurd amount of steals has resulted in a ton of easy looks. Per hoop-math, Minnesota is tied for 5th (with—surprise!—Louisville) in the percentage of shots taking place within the first 10 seconds after a defensive steal (i.e., a fastbreak). But we saw similar success from Minnesota last year as well, but Big Ten teams were not nearly as vulnerable to Pitino's pressure. I see no reason to believe something's changed in that regard.